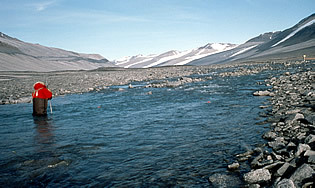 House Stream flows into Lake Chad on the north shore, and drains the east side of the Suess Glacier. 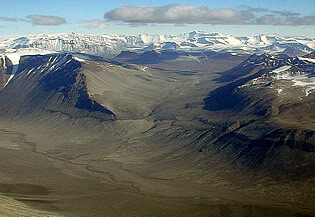 House Stream flows through ice bound moraine and is shaded for most of the day. The rocks in the streambed particles are angular fragments of broken boulders. The gauge at House Stream is located about 100 m upstream from the lake where the valley has become fairly steep sided. Stream length: 2 km. 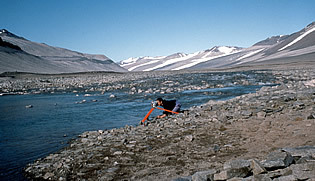 Hydrological, biological, chemical, and physical property measurements have been made for a number of McMurdo Dry Valley streams and lakes. The Onyx River flows west (left) toward Lake Vanda. View north from Wright Valley through Bull Pass into Victoria Valley. 0. Photo: Josh Landis, NSF/RPS. Surveying for placement of Onyx River gaging station near Lake Vanda. 1990. Photo: Sarah Spaulding. Measuring discharge in the Onyx River. 1990. Photo: Sarah Spaulding.